Here's a question from a new guy to the hobby. Should the headlight bar on a '26' coupe be gently curved ( lower in the middle and higher on each end) or has mine been carefully bent. I like the way it looks with the curve, like she's smiling at everyone. I just don't know if it's supposed to be that way. Ford used several designs for the light bar before he settled on the final design (see: http://www.mtfca.com/encyclo/I-O.htm#lamps and scroll down to 1926 & 1927). 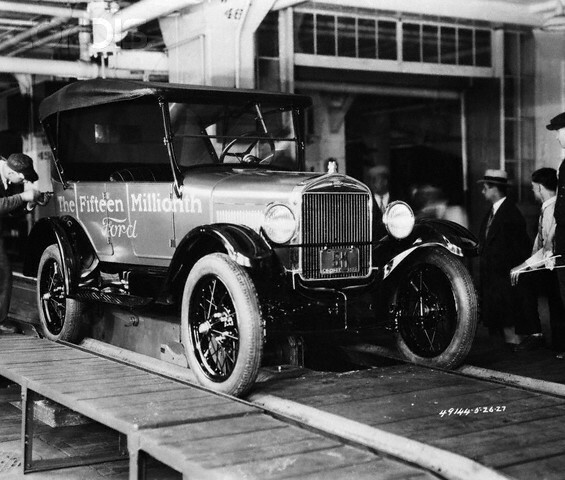 For sure the final style introduced during 1926 and used throughout 1927 was a straight bar as shown on the 15,000,000 Ford below. If someone could confirm that the earlier bars were also straight across (I believe they were but I did not find any good photo to illustrate that). I found many early 1926 photos without the bar but not known 1926 with the early bar. I have seen these variations, and I have a different style on my 1926 wagon. It came from Model T Haven, so it may or may not be a Ford part, though it is the correct period. It bolts between the fenders and lamp bases, and has a cross bar that resembles narrow channel iron. How do your fenders fit? It seems to me that if you were to bend a straight brace, the fenders would be drawn together. Hmmmm, My '26 headlamp bar is yet another not-pictured example. Unfortunately I don't have the technology to provide ya'll a picture. Got it from Jim Patrick and it, too, is adjustable and 'straight across' not bowed. Thanks Guys, I now know that it is not original, but I like it anyway. I haven't seen a curved one. Maybe an after market product, or someone bent it. How straight are the fenders? Maybe the fender brackets have been bent and the bar was either bent at the same time or bent to fit between them? Here is my 27 smiling at everyone. Thanks folks for helping me figure this out. Merry Christmas to all. If you're smiling? I am grinning from ear to ear!